Art and the automobile go hand in hand. For as long as there has been sales literature, there has been a demand for eye-catching illustrations. With the automotive industry constantly looking forward, there has also always been a need for artistic interpretations of the future. One of the most prolific automotive artists to have dabbled in both was that of Arthur Radebaugh. Radebaugh was born in Coldwater, Michigan in 1906. He developed his interest in art and briefly attended the renowned Art Institute in Chicago. 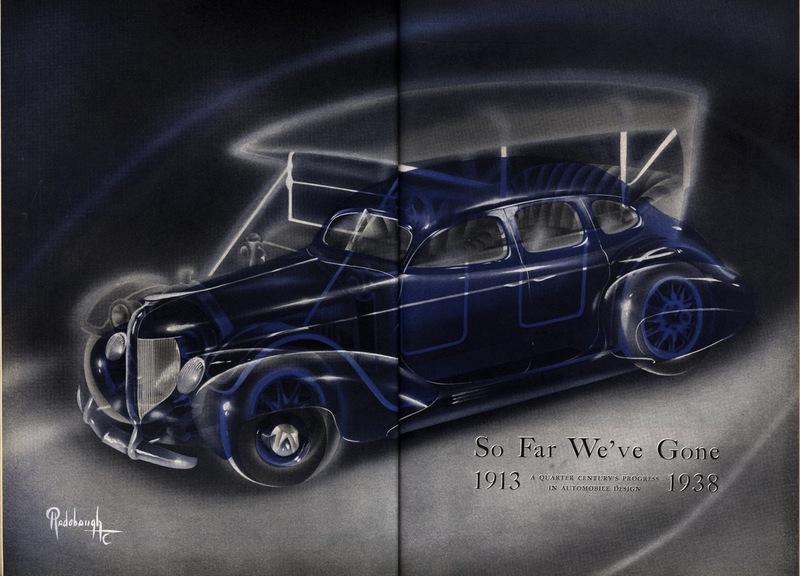 It was there that Radebaugh first began experimenting with airbrush painting, a technique he helped popularize and used throughout his career. As an artist, one of his first jobs was designing candy boxes at Crescent Engraving in Kalamazoo. Before long a salesman noticed Radebaugh’s airbrush art, was impressed by what he saw, and offered to be his agent. Radebaugh accepted. One of his first clients in 1935 was MoToR Magazine, which purchased a painting for $450 and used it for the highly coveted cover of the Annual issue through 1957. With the exception of years 1941-1946, he designed covers for every Annual issue through 1957. 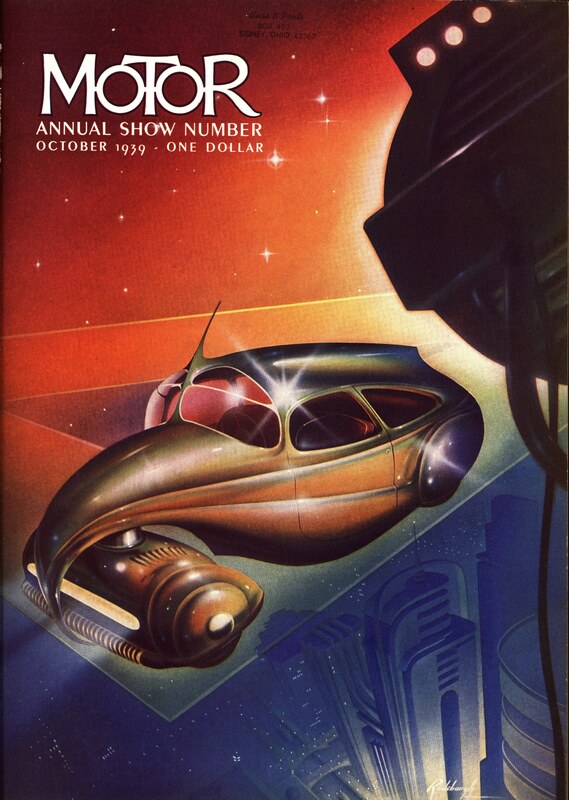 Radebaugh’s artistic vision of the future fell in line with the forward-thinking nature of the automotive trade shows that the Annual issues were published to coincide with. His paintings drew heavily upon the art deco movement of the 1920s through the 1940s, though his style would evolve with the passage of time. His renderings of the future were inspired by the context of his present. 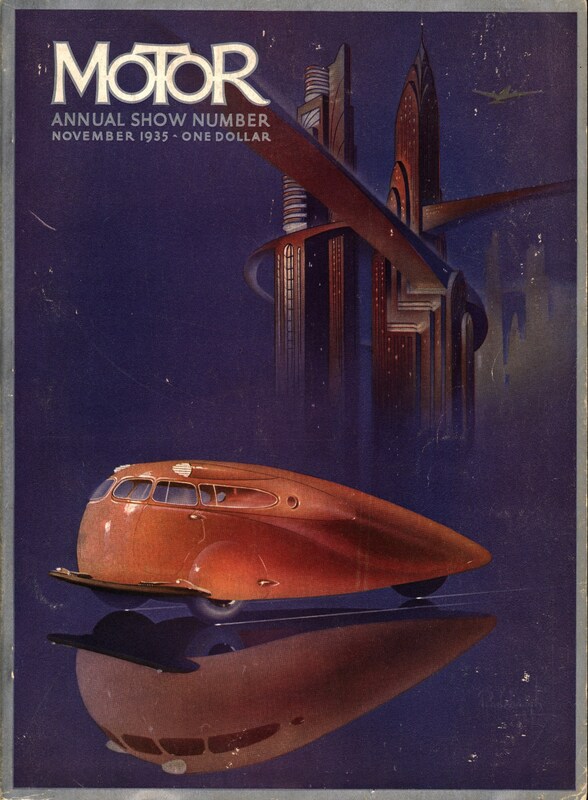 Looking at the 1935 MoToR Annual cover, the teardrop-shaped vehicle on the cover appeared to be loosely inspired by the streamlined forms of the 1933 Dymaxion and 1935 Stout Scarab. By comparison, his crazy-looking cars on the 1956 MoToR Annual cover sported the iconic fins and chrome characteristic of the 1950s. Radebaugh’s work with MoToR garnered him widespread attention, and his list of clients grew to include several big-name brands including the Saturday Evening Post, Fortune, Coca-Cola, and United Airlines. 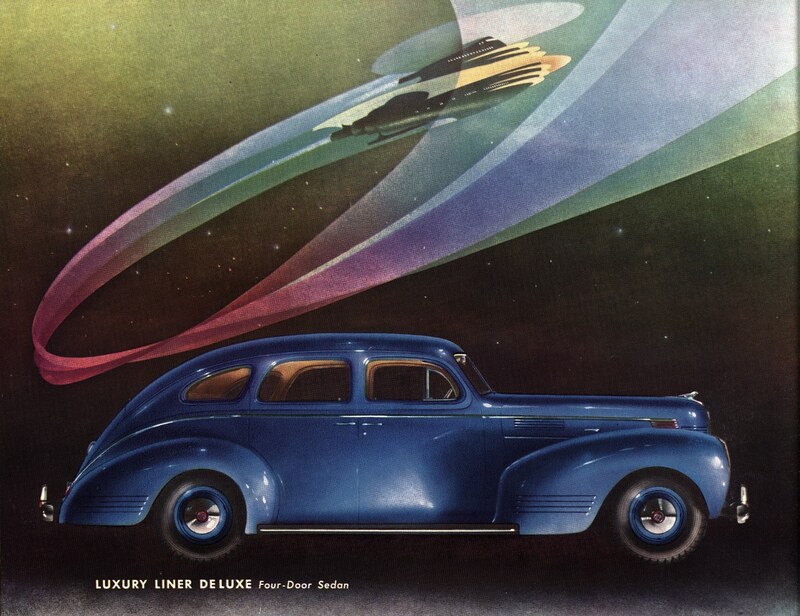 The automotive industry also took note, with Chrysler contracting him to do artwork for their 1939 Dodge Luxury Liner sales literature and advertisements. For the marque’s 25th anniversary, Radebaugh blended the present with the future by painting the 1939 model year cars in front of lush science-fiction-inspired cityscapes. It was around this time that the military also became interested in Radebaugh. During WWII, the U.S. Army Ordinance Department hired him to lead their design and visualization division. He and his team of artists were tasked with designing concepts for military technology, including the use of black lights in instrument panels to aid in stealth. This particular project introduced Radebaugh to the world of fluorescent paint, with which he continued to experiment throughout the remainder of his career. After the war, Detroit resumed production of civilian vehicles. 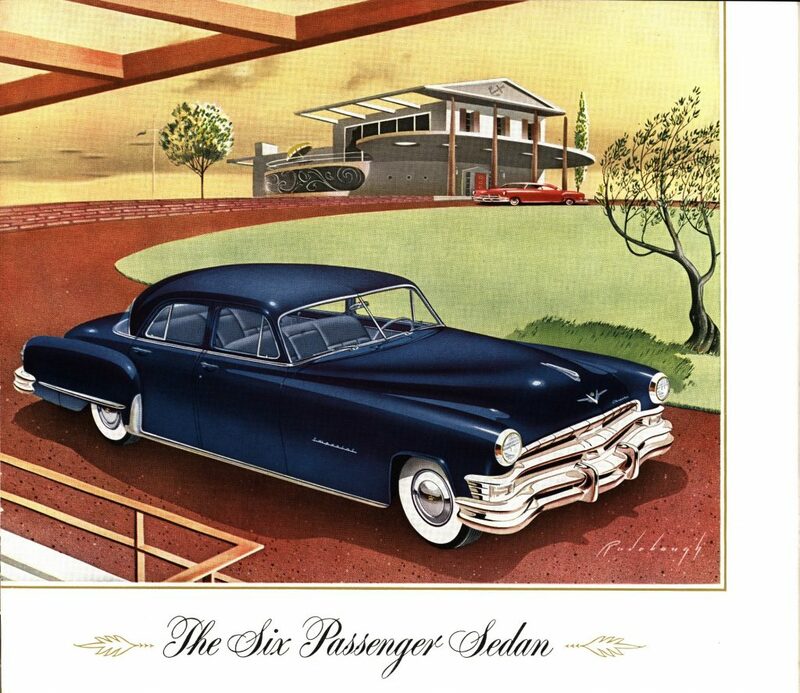 In 1946, Detroit was celebrating the 150th anniversary of incorporation and the American automotive industry’s Golden Jubilee (the 50th anniversary of the first Detroit-built automobile, the 1896 King). When the event committee wanted an emblem for the event, they commissioned Radebaugh to create it. 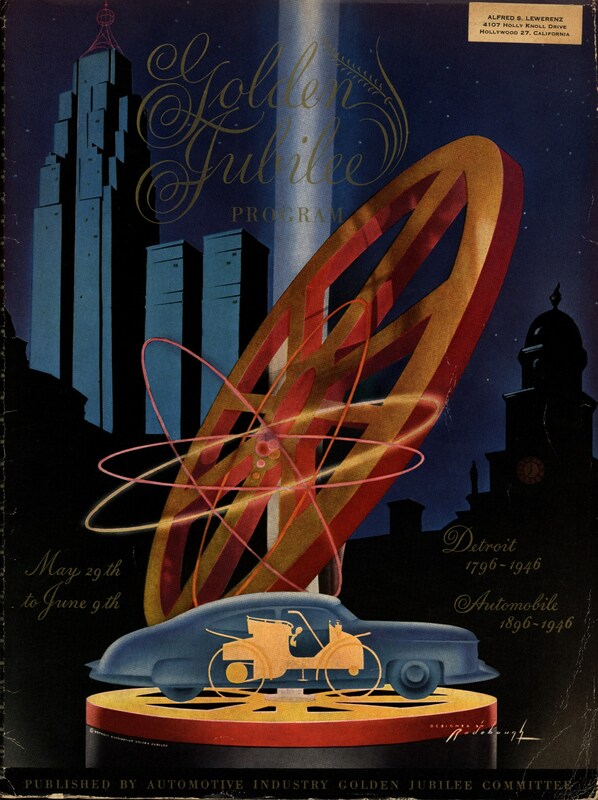 The resulting design consisted of symbols of the industry’s past (an antique car), present (a modern car) and future (an atom representing nuclear energy). 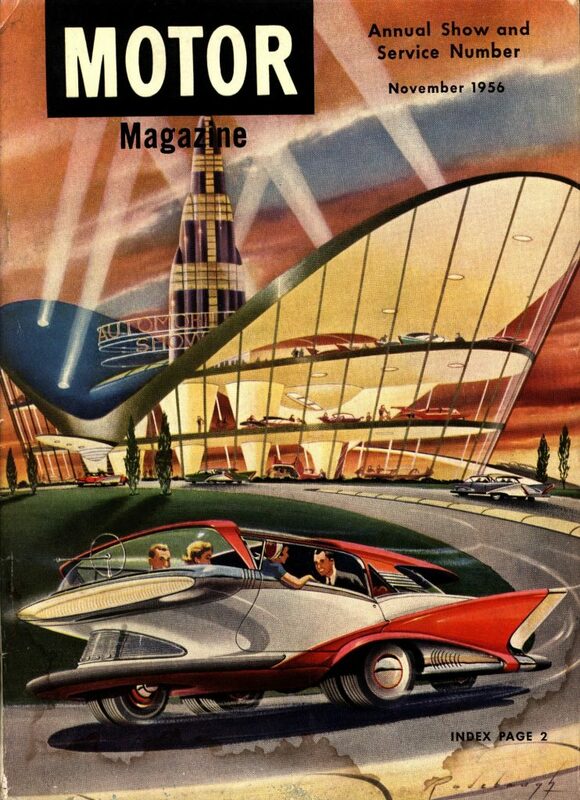 In the postwar period, Radebaugh went on to do several ads for Bohn Aluminum and Brass Corporation featuring futuristic vehicles that were often over-the-top in appearance. 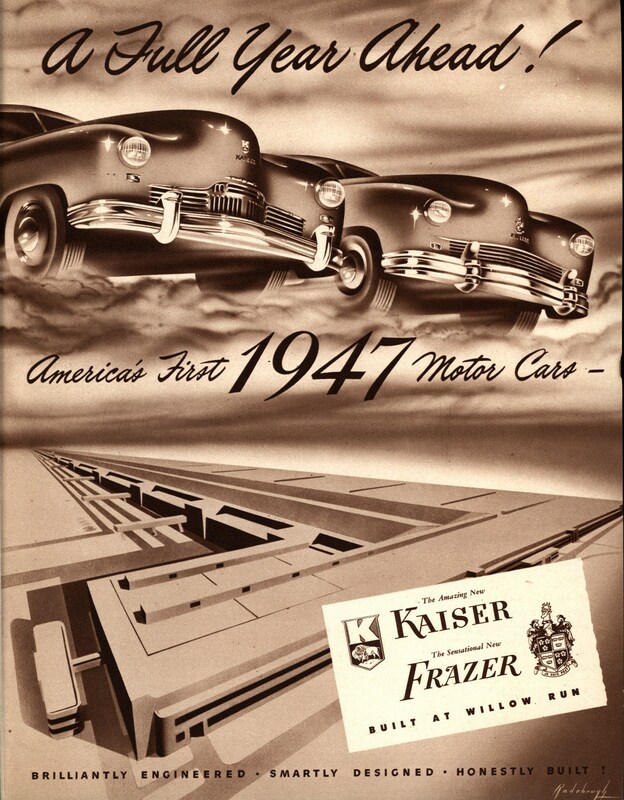 He also created sales literature artwork for Kaiser-Frazer in 1947, Nash in 1950 and Chrysler in 1951. 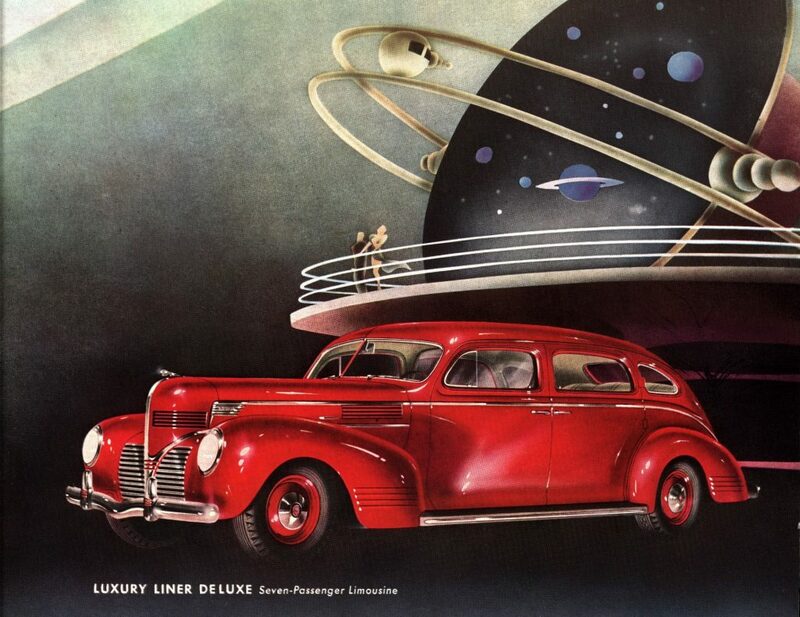 While these illustrations were distinctly his style, they lacked the science-fiction-inspired overtones found in the 1939 Dodge catalog. As the 1950s wore on, the industry’s demand for Radebaugh’s work declined due to the increased use of photography. Fortunately, he was able to find new life as an artist in 1958 with the introduction of his weekly newspaper comic strip, “Closer Than We Think!” This provided Radebaugh a platform to share his artistic predictions for the future, covering everything from mail carriers with jet-packs to a solar-powered “Sunray Sedan.” At the height of its popularity, “Closer Than We Think!” reached more than 19 million readers in the U.S. and Canada. It ran until 1963 when ill health forced him into retirement. Despite his long and successful career, he encountered financial problems in the last leg of his life. Little more than a decade later in 1974, Radebaugh passed away in a veterans hospital. Since then, Radebaugh’s work has been rediscovered and has garnered quite a following. So long as the need for technological improvements remains there will always be an appreciation for those who dare to dream the future as he did. At the AACA Library, Radebaugh’s memory lives on through a collection of MoToR magazines, sales literature, and 1946 Golden Jubilee programs. If you are interested in seeing more of his artwork be sure to contact the library or pay a visit. You never know what you’ll find here!